Really, I am just trying to get a bunch of things out of my house because I am very close to becoming a storage facility. I thought I'd offer these to my fellow geeks first! What isn't sold in this auction will be donated to the Westfield Band Garage Sale Fundraiser on Nov. 9th at 8 a.m. If not sold there, it goes to my local thrift store. 1. All "bids" are BIN (Buy It Now). I want to sell them and sell them quickly. 2. If you want several items on the list and would like to make me an offer, geekmail me. However, if someone has already BINed one of the items in your offer, I cannot accept it since they bought it first. 3. Shipping will be paid for by the winner. Games will be shipped via USPS Priority, but if you allow me to ship to your place of employment From my place of employment, I might could swing VERY reduced shipping costs by sending UPS. VERY reduced. I can't send UPS to a residence though, only USPS. 4. I will combine shipping if you win multiple items. I won't be able to ship until Tuesday at the earliest though. 5. Shipping to USA only. Sorry my International friends, I have another auction planned so maybe next time. These aren't high value or high demand games so I don't expect someone to want to pay int'l shipping for them anyway. Local Houston pick-up is fine with me! 6. Sorry, but PayPal only unless you are doing local pick up, then cash is fine. 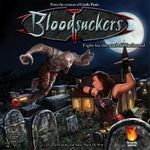 Games will be listed in the marketplace to ensure BGG gets their 3% cut. End date: Nov. 9 at 2 a.m. CST. No more bids after this time. What has not been sold will be taken to the garage sale at 7 a.m. I may add a few more games throughout the week. 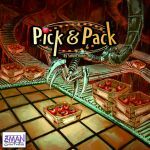 Puzzle Strike second edition, Grave Business, Pick and Pack, Adam and Eva, Zombie Fluxx, Battle Cattle, Car Wars The Card GameMission Command Sea, Mission Command Air, And Mission Command Land are all on the closet clean out list. Let me know if you are interested in any of these and I'll add them to the list to purchase. Edit 1: I have moved sold items to the bottom of the list. Edit 2: I have added Car Wars the Card Game, Battle Cattle Card game, and the Mission Command Air, Sea and Land due to expressed interest. 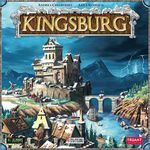 Also added Kingsburg, Pitchcar, Big Bang Theory Party Game and Atlantis. I will be adding more later. Edit 3: Moved more games to the bottom of the list that have been sold. Also added Monster Mayhem, We Didn't Playtest This at All Kickstarter lot, Zombie Fluxx, Con!, Pick and Pack, Duell, Adam and Eva, and Grave Business. No other games will be added to this auction. I actually have 3 sets that I have packed into two game boxes. The cards and figures are still in shrink. We used the terrain to play Take the Tower miniature games. I realize most folks will only want the terrain so I don't mind if you want to save some shipping. The first two BIN bids each win a copy of the complete game. Complete, though box has one torn corner. Box and contents in good shape, complete. Easy to teach non gamers and kids. Played a couple of times, complete. This is the Deluxe Rook boxed set, which includes the Rook card game, Rook in a Book Players Guide, score pads, and an Extra set of unopened Rook cards. NIS + promo card (also NIS). Signed by the designer, played about 4 times. Played a few times only. 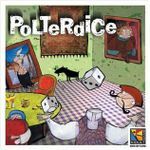 2 player game, Knizia, played about a dozen times by adults. Punched and played, twice I think. Box shows slight wear from being carried to gaming group meetings. 2 player game, played a couple of times only. Battle Cattle and Car Wars the Card Game can be played together to double the amount of players. Box is intact. Battle Cattle cards were hardly played at all. You get the D10 and D6 we used for counters for free. Angus Khan character card looks like it is slightly bent. This is definitely a PLAY copy. The Car Wars cards have been played but there is still good sheen. There aren't any bent cards and I always made the players clean their hands and no food or drinks on the table. I notice one bent corner on the War Hawk character card. You get the D10s and D6s we used for counters for free. This is definitely a PLAY copy. 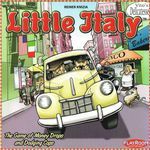 Shrink removed but never played. Cards still in shrink. 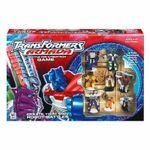 Easy version of Star Wars Epic Duels, even kids can understand and have Transformer figures thay know and love. I pledged at the $29.00 level on the Kickstarter because the boys had such a great time playing the game. It was our go-to game for Saturday nights at Dennys. So Hey, when the Kickstarter came up with new cards and stuff, I was so IN and pledged. By the time the cards got here, the boys had moved on to Cards Against Humanity, girls, and Black Ops. Wow, they grow up so fast. My loss is your gain! You get everything I pledged for, took the shrinkwrap off to look at, and never played - The Sharpie, The WDPTAA: Legacies game, and the new version of WDPTAA. 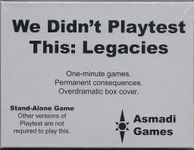 You also get aused copy of We Didn't Playtest This Either. Base set, complete but it has been played. Box is tight but shows slight wear. Hey Patrick, I was going through to pack the contents and discovered I actually have *3* sets of game pieces, instructions, and buildings (1 set of buildings is unpunched). Unfortunately there is only one box and one game board, You get all of it, in case you'd like to offer parts to some poor geek with an incomplete thrift store game. I recall why I have the extra pieces now - I bought several copies and the boys and I played army men versus the dinosaurs in the ruined buildings. In fact, the ruined paper buildings were also used in several ATZ: All Things Zombie miniature games in summers past. I also keep a Mall Madness game around for playing ATZ when the nieces come to town. Like New - only removed from shrink. Inner contents are still in shrink and unpunched! We either play online or on IOS or with another game group member's set. Complete, great shape. Knizia, enough said. 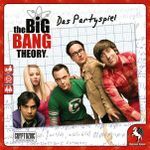 Starter set + expansions 1,2,3,4 and 5. Also includes two laminated playmats and a Battlecards: WorldConflict Pacific Theatre starter set. Played maybe twice, complete. Contents in great shape, cards were sleeved, box is tight but has three holes in it from storage.